Welcome to LunarNET's EBC characters section! Below are bios from the major and minor characters of Lunar: Eternal Blue Complete. You may notice that, since the storyline is largely unchanged between Eternal Blue and Eternal Blue Complete, the character bios below are also largely similar to to the originals... with a couple of exceptions. 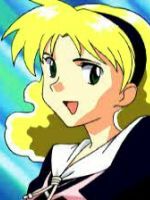 There were two voice actor/actress changes in the US version (Hiro went from Mark Zempel to Chad Letts, and Luna went from Rhonda Gibson to Kathryn Kirk), and two voice actor/actress changes in the Japanese version (Lunn went from Kouji Yada to Masaharu Satou, and Luna went from Kikuko Inoue to Masako Ikeda). We also have some entries for Mystere and Luna this time. By the way, bear in mind that this section does contain spoilers for both Silver Star Story and Eternal Blue Complete. 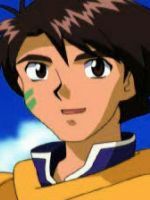 Hiro is the main character of the story. Together with Ruby and Gwyn, he lives out in the remote Salyan Desert, exploring ancient ruins and uncovering artifacts from the earliest days of Lunar. He's fascinated by the ancient myths and legends from history; perhaps one day his destiny will be to become a legend himself. Many aspects of Hiro's origin, like his parents, his birthplace, or the source of the tattoos on his face, are never explained in the game (he calls Gwyn "grandpa", but it's never specified if this is literal). There are theories that he has some Vile Tribe blood, but this isn't substantiated by any game or book sources. 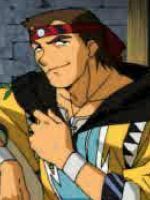 Lastly, his name was originally transliterated as 'Hiero' in the Japanese version. Lucia is a mysterious visitor from the Blue Star. She first awakens sensing a grave threat to Lunar. When she arrives at the Blue Spire, the first person she encounters is Hiro, who agrees to help her on her quest to see the Goddess Althena. It's no easy task, as Lucia is pursued by both White Knight Leo of Althena's Guard, and the same dark force that threatens the world's very existence. It's clear that she is immensely powerful, but her complete unfamiliarity with the ways of humanity is equally perplexing. Lucia is established as being not-quite-human, and has been around at least as long as Lunar has been (she was placed into sleep the same time as the Blue Star was destroyed). The game never makes clear what she is, only that her purpose is the restoration of the Blue Star; although, the novels do refer to her directly as the 'goddess' of the Blue Star. Her name in the Japanese version was originally transliterated as 'Lucier'. Ruby is Hiro's longtime companion. A strange creature (but certainly not a flying cat) who can talk, fly, and breath fire, her origins are unknown, but she's been with Hiro as long as they both can remember. While she sometimes comes across as a bit immature, she has a great affection for Hiro and gets quite jealous once Lucia enters the picture. In the game, Ruby only has her flying cat form. There were early sketches for her in human form (in the Lunar I+II artbook), but these were never worked into any part of the game, novels, or manga. She also insists that she's Hiro's girlfriend, although she's more blunt about it in the Japanese version. Ronfar is a former priest, current gambler, living in the desert village of Larpa. He ran away from the priesthood and his hometown of Raculi after it was struck by a devastating plague. But his past, and whatever he ran away from, continues to haunt him. These days, he spends half his time helping the sick in Larpa, and half his time drinking and gambling in the bar. The game implies some past connection with Gywn (which is why Gwyn knows of his presence in Larpa at the beginning of the game), but doesn't explore that much further. His name in the Japanese version was also transliterated as 'Rong-Fa'. Jean is the star dancer of the Madoria Plains carnival. But she wasn't always a performer; years earlier, she was found by the travelling carnival, bloody and unconscious, in a torn karate uniform. They took her in as one of their own, never asking about what happened or who she was running from. Jean's past is pretty well established by the end of the game. However, there's a key difference between the US and Japanese versions. In the US version, she says nothing about her past to either her friends in the carnival, or Hiro and his party, until the middle of the game. In the Japanese version, it's established that she's already talked about her past with others in the carnival, and mentioned at least the Black Karate of Death and a Masked Man. Lemina Ausa is the acting head of the Magic Guild of Vane, a once-illustrious institution that isn't so illustrious anymore. She's constantly on the lookout for money to restore the Guild, and recruits to restore its membership. She's quite young, and sometimes overbearing, but her enthusiasm and devotion to restoring both the Guild and Vane to its former glory can grow on you. 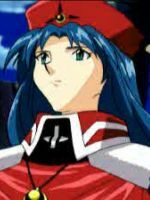 Lemina is the only one with an established lineage to other characters in earlier Lunar games (Mia Ausa, obviously). Some of her earlier childhood is also established in the 'Lemina in Training' novel. Her original transliterated name in the Japanese version was 'Remiena'. Leo is the leader of Althena's Guard, the elite class of soldiers dedicated to protecting Althena and maintaining the interests of the Cult of Althena around the world. At the start of the story, he is sent on a mission to capture the alleged destroyer Lucia before she can accomplish her mission. But as time goes on, he begins to question exactly what Althena, and the Cult, are after. In the US version of the game, Ruby jokes about Leo being 30 years old, but this is never established as his actual age (the Japanese version states that he's 18 years old; the US version implies that he's older but doesn't give a specific age). 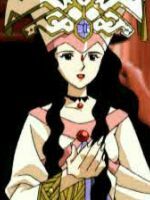 Mauri is the highest ranking priestess of Althena. A terrifyingly powerful woman, she spends part of her time at Serak Palace, and part of her time enforcing Althena's will across the world. She is also Leo's sister, and from the village of Raculi. She has a past with Ronfar, but rarely speaks of it to this day. 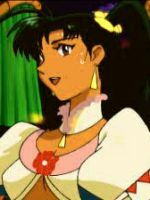 Mauri is established as Leo's younger sister (in the Japanese version, she's placed at 16 years old while Leo is 18; the US version gives no specific ages, but they're both implied to be older). Also, Mauri's name in the original Japanese version was transliterated as 'Mauli'. 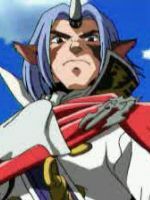 Lunn is one of the most powerful martial artists in Lunar, a top-ranking member of the Cult of Althena, and currently acting as the mayor of Meribia. He's converted the mayor's mansion into a world-class dojo, teaching the men who work for him and anyone strong enough to endure his harsh training. While he and his men keep law and order in the city, he can come across as cold and ruthless at times. 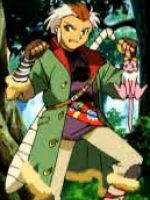 Lunn's name in the Japanese version was transliterated as 'Rainus' (similar to the name 'Linus'). Borgan is currently the most powerful wizard in Lunar, and another top-ranking member of the Cult of Althena. Rather than deal with the ancient city of Vane, he's established the completely new city of Neo Vane, where only the most elite magicians are allowed to enter. 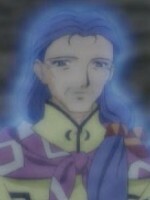 But, his secretive nature, obsession with magic, and infatuation with Miria Ausa (Lemina's mother) are at least suspicious, if not outright dangerous. There's a bit more about Borgan's background in the novel 'Lemina in Training' novel. Also, Borgan's name in the Japanese version was transliterated as 'Bawgan', though it's almost the same pronunciation. Gwyn lives in the Salyan Desert, taking care of and looking after Hiro and Ruby. An archaeologist himself, he spends his time researching and investigating the colorful history of Lunar. When a mysterious light shines from the nearby Blue Spire, Gwyn, Hiro, and Ruby, set off to investigate. Gwyn is called 'grandpa' by Hiro, but it's never established if this was literal or figurative. 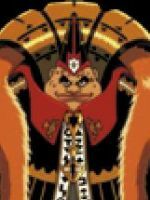 His appearance (half- or full-beastman) would seem to indicate that it's figurative, however, since Hiro doesn't look part-beastman himself. 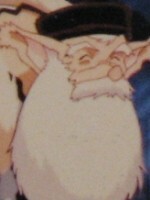 His original transliterated name in the Japanese version was also 'Guen'. Nall is the leader of the Lostest Boys, a group of orphaned kids who live at the abandoned ruins of Taben's Peak. He takes care of the kids until they reach adulthood, acting as sort of a father/older brother to them. 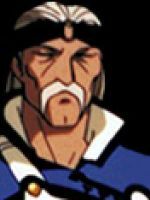 And while he knows plenty about the long history of Lunar, especially regarding Dragonmaster Alex, he's much quieter about his own background. 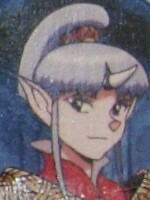 Interestingly enough, Nall's age is given as about 500-600 years (estimated) in the Lunar I+II artbook; furthermore, the Japanese manual doesn't give any specific amount of time between the events of Lunar 1 and Lunar 2, unlike the US manual which clearly states it as having about 1000 years between them. (For LunarNET's timeline, we go by the US sources in this case.) Also, why Nall can transform into human form isn't fully explained--including if he's the only one who can, or if all dragons have that ability. Mystere is the Masked White Knight, the envoy of JUSTICE, the protector of the innocent and defender of TRUTH! This heroic masked... uh... hero... journeys throughout Lunar, helping the helpless and driving out evil from wherever it may lie. Bad guys can't hide from Mystere, and even the most daunting tasks become trivial before him. He arrives just in the nick of time to save Hiro and his friends from certain danger, and leaves just as mysteriously as he came. 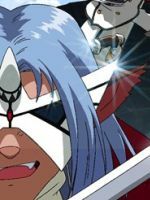 Mystere never had a name in the Japanese version, and was just referred to as the "Masked White Knight". Also, Mystere is totally not Leo--you can tell because he has his own theme music. The same character never gets more than one theme song. The Goddess Althena is the goddess of love and beauty, and the central goddess of Lunar. In times past, she would periodically be reborn as a human and live among the people of Lunar. These days, however, she stays in the inner sanctum of the Holy City of Pentagulia, surrounded by Althena's Guard and the Cult of Althena. A ghost from the past, Ghaleon was revived by dark forces for some unknown purpose. 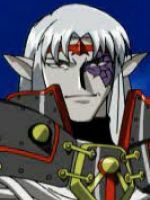 In his past life he attempted to defeat the last Dragonmaster and enslave Althena; now, he has taken on the title of Dragonmaster, and works on behalf of Althena. But his real motives are entirely unclear. Zophar is the dark god of death and destruction. Long ago he was sealed away by Althena, but not before he destoyed the Blue Star and nearly the whole of humanity. After he was sealed away, Althena brought the remaining inhabitants to Lunar while the Blue Star recovered. So much time has passed that most people of Lunar now know virtually nothing about Zophar or the chaos that he once caused. The existence of Zophar implies that there are multiple gods in the Lunar universe; Althena and Zophar are the only two consistently referred to as gods/goddesses (Lucia is only mentioned as a goddess in the novels, and there are references to demigods and other holy/unholy creatures in both major Lunar games). 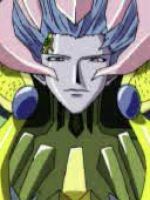 Lastly, in the Japanese version, his name is still 'Zophar' but it's given as being a shortened form of his complete name of 'Zone-Pharaoh'. The story of Alex and Luna was passed down through the generations; nearly everyone is familiar with it. While Luna does not have a direct presence in the game, she does leave a few messages behind that stand the test of time and make their way to Hiro, Lucia, and the others. One change between the original and remake is that, in the original EB all images of Luna show her as a young woman (perhaps only slightly older than the events of TSS), while in the remake EBC the image of her is of her as a much older woman (perhaps in her senior years). The presumption was always that she chose a mortal life, but it was only in the remake that we saw any evidence of her actually aging.